To the east of Cagliari, the coastline is one of the most alluring on the island and is sprinkled with residential resorts such as Solanas, Porto Sa Ruxi and Villasimius. The town provides a friendly and lively holiday base, with plenty of restaurants and bars, its streets thronged with families for the traditional evening stroll. As is the case of most 'coastal' towns, Villasimius is about 2km inland - continued invasion from the sea over the centuries pushed the Sardinian population inland. The Costa Rei is the coast just to the north of Villasimius and is a pleasant seaside town with a mixture of shops, bars and restaurants. This whole area is blessed with some outstandingly beautifully long sandy beaches and crystal clear seas which are almost tropical in their brilliance. A range of boat excursions operate from the beaches here and offer a number of trips including one to Isola di Serpentara. 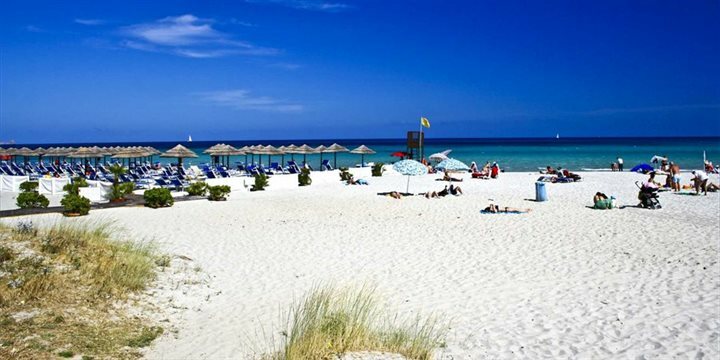 Solanas offers the longest stretch of sand in the area, making it a real favourite with families seeking a beach holiday, whereas Porto Sa Ruxi, nestling on a rocky promontory washed on both sides by the sea, is perfect for swimming and snorkelling.